by Rev. 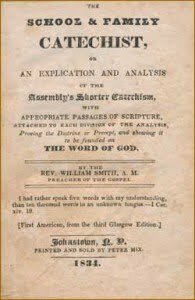 William Smith of Glasgow (1836). Q.6. How many persons are there in the Godhead? There are three persons in the Godhead, the Father, the Son, and the Holy Ghost; and these three are one God, the same in substance, equal in power and glory. Three persons in the Godhead.—Three who are spoken of in the word of God, under the characters of the Father, the Son, and the Spirit; all subsisting in the same divine nature or essence. Same in substance.— Equally possessed of all the attributes or perfections of the divine nature. Glory.—The brightness of the divine excellencies. That there are three persons in the Godhead.—Matt. xxviii. 19. Go ye, therefore, and teach all nations, baptizing them in the name of the Father, and the Son, and of the Holy Ghost. That these three distinct subsistences are but one God.—John v. 7. [sic: ed. ; I John v. 7.] These three are one. That they are the same in substance, or nature..— John x. 30. I and my Father are one. John xv. 26. The Spirit of truth which proceedeth from the Father. That they are equal in power and glory.— 2 Cor. xiii. 14. The grace of the Lord Jesus Christ, and the love of God, and the communion of the Holy Ghost, be with you all, Amen.